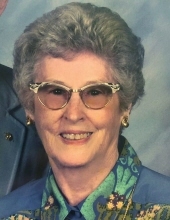 Olive Louise Atchley, of Mattoon, passed away at 6:45 P.M. on Tuesday, November 13, 2018, at her residence. Graveside services in tribute to her life will begin at 1:00 P.M. on Saturday, November 17, 2018 at the Ash Grove Cemetery. No visitation is planned. Schilling Funeral Home is in charge of arrangements. Louise was born in Shelby County, a daughter of Isaac Ezra and Cora Mae (Steele) Cox. She married James D. Atchley on July 15, 1939. He preceded her in death. She later married Billy Joe “B.J.” Jones on March 1, 1997. He passed away in 2012. She was also preceded in death by her parents, one daughter Mary Ellen Atchley, and her sister, Evelyn Keck. She is survived by her daughter, Mrs. Jeanne Lou Atchley (Gordon) Bubeck, of Phoenix, Arizona. Louise was a licensed nurse at the former Mattoon Memorial Hospital. She was a member of the Ash Grove Christian Church. She was a member of the Women of the Moose. She will be sadly missed, but fondly remembered by all who knew her. Memorial gifts in her honor are suggested to Lincolnland Hospice 1004 Health Center Drive, Mattoon Il 61938. To send flowers or a remembrance gift to the family of Louise Atchley, please visit our Tribute Store. "Email Address" would like to share the life celebration of Louise Atchley. Click on the "link" to go to share a favorite memory or leave a condolence message for the family.